You can purchase an ad-free downloadable pdf of this pattern in my Ravelry shop. This pattern is worked from the bottom up in 6 pieces – main body, 2 eyes, 2 wings, and the beak. The main body is worked from the base (which is back and forth) and the you work around the piece and up in the round, with a slip st into the first st. The eyes are worked in the round with a slip st into the first st. The wings are worked back and forth, with a turn at the beginning/ end of the row. 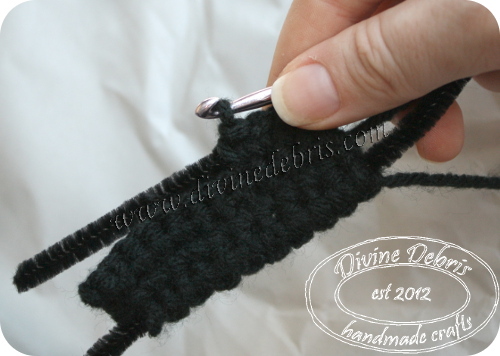 The ch 1 at the beginning of some rows does not count as a stitch. 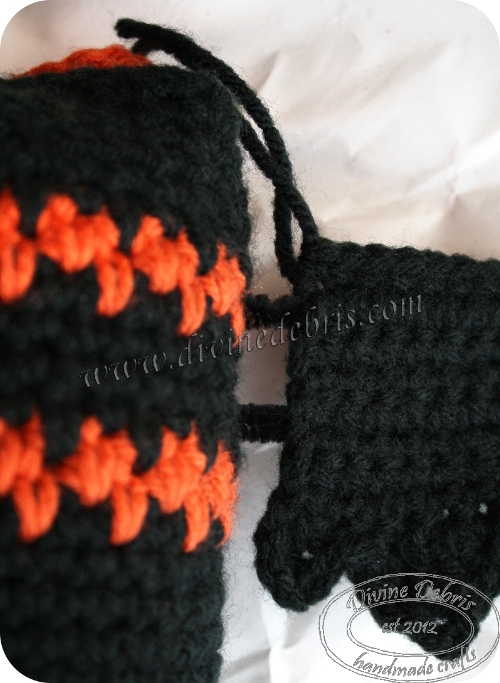 For the wings, you crochet around the pipe cleaners and leave space on the edge, where you will stick the finished wing into the body of the ow-bat. There are photos below that might help this make sense. 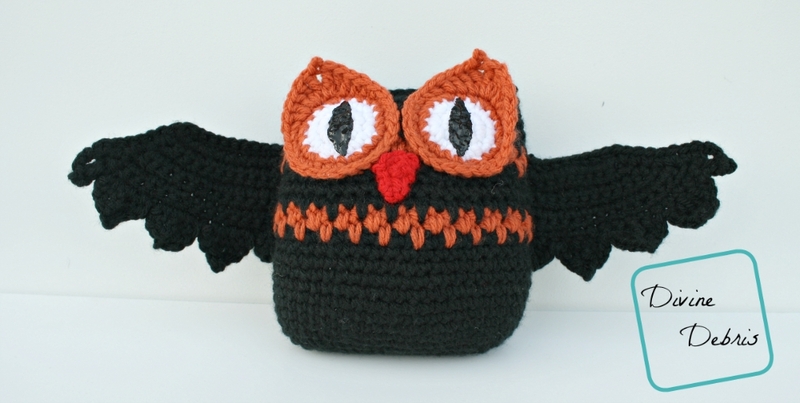 Color A is black, color B is orange, and color C is white in the owl in the photo. For the spike sc rows, you will work into the row below your current row. You don’t have to fasten off between color changes in the main body (unless you want to), and just drop the yarn and pick it back up when you need it. You’ll need to know how to create a slip knot on your hook for this pattern. With color A, create a slip knot on your hook and fold your ami in half (so that it lines up with the base), sc into both sts across the opening. Make sure to stuff your ami before you close it all the way. Note: row 5 is different for the right and left eyes. Fasten off. Leave a long end, use it to attach the eye to the body of the owl-bat. Fasten off. Weave in ends, attach the beak below the eyes on the body. You can also draw a downward pacing triangle with puffy paint if you’d rather than make a beak. Fasten off leaving a long tail. Leave a long tail, use it to attach the wing to the body. Leave a portion of the pipe cleaner sticking out of the side of the wing that attaches to the body of the owl, stick it into the body between the scs, this helps to keep the wing in place and makes it pose-able. (see photo on the right). Attach the wings with the top of the wing in the top most spike sc section. Copyright @ Divine Debris 2012 – 2015. No part of this document may be reproduced or transmitted in any form by any means, electronic, mechanical, photocopying, or otherwise, without prior written permission from the author. Sales of finished product are permitted, but designer requests that you link back to pattern and credit Divine Debris with the original design under the Creative Commons Attribution-Share Alike license. If you have any questions, comments or concerns please contact info@divinedebris.com.